Every once in a while, watch geeks like us get introduced to a new diver. For some of us that’s very cool and something to celebrate and for others it’s a moment of silently weeping over another diver. Either way, the introduction of a new diver’s watch is something that gets noticed. Today, I have the honour to talk about the latest addition in the Oris Sixty-Five collection. A new diver measuring 42mm in diameter and combining the best of both worlds. 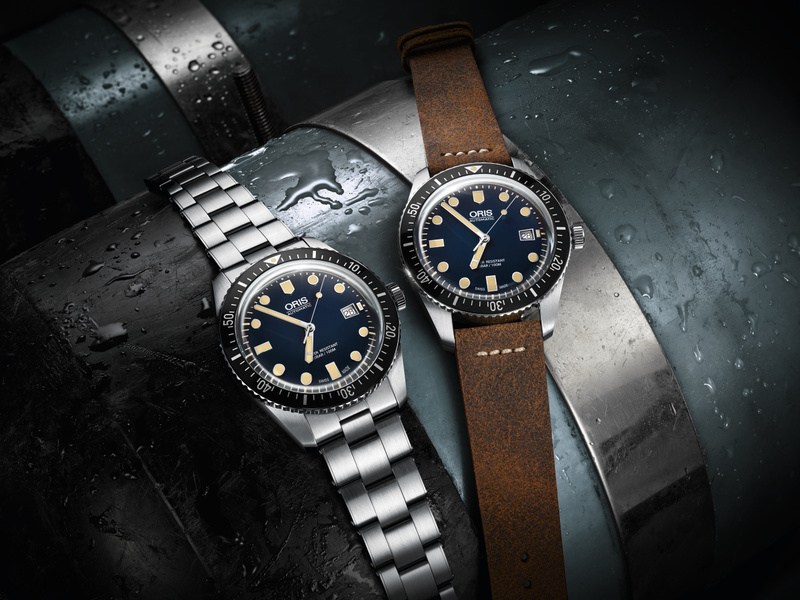 A vintage look and feel from back in the days – the 60’s you know, ultimate diver’s watch era – with modern touches and finishing. Since the introduction of the collection, I have to admit a little bit of fanboy in me came outside to play. The problem with divers is their size. Now, 42mm is not exactly small but a size that is acceptable. In my opinion the diameter isn’t the only thing that matters in the design of divers – of course a diver measuring around 32mm of size is a bit tiny and could cost a diver a lot of oxygen because of intensively looking at his watch. Which naturally has the consequence of forgetting to swim, breathing heavily and all sorts of things that make you look like a complete fool – besides the amazingly small watch. The origin of my point was the design of a diver’s watch. Some like it big, others like it to be very slim. Slim as in lugs that don’t have the look and feel of bigfoot’s ankles and fluently fit onto the case. Slim as in a shape that looks very elegant but still has the robust feeling of a diver. Exactly that sort of design is what made me like the Sixty-Five collection. As I said, measurements in terms of diameter don’t bother me that much. Of course 42mm could be seen as big, but then again it’s the whole package and Oris did a good job on that package. Most divers have very heavy look. Like the watchmaker decided to pick up a very large case and squeeze a bezel on top of it. As a tradition, a diver’s bezel isn’t very inconspicuous either so that makes one hell of a watch. Take a look at some of the divers that have been seeing the light of day. For instance the Omega Seamaster 120m ‘Baby Ploprof’, the Omega 600m Ploprof, Seiko Dive Chrono 200m and so on. Not exactly your average slim watch. 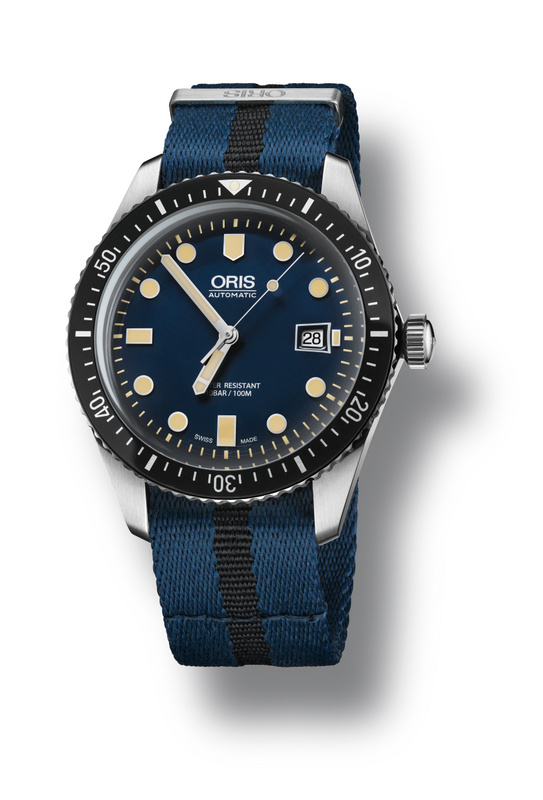 Oris therefore wins my one on one dive holiday to the Maldives. Isn’t that cool? No seriously they did a good job with this collection and the addition of a 42mm watch is a welcome family member. 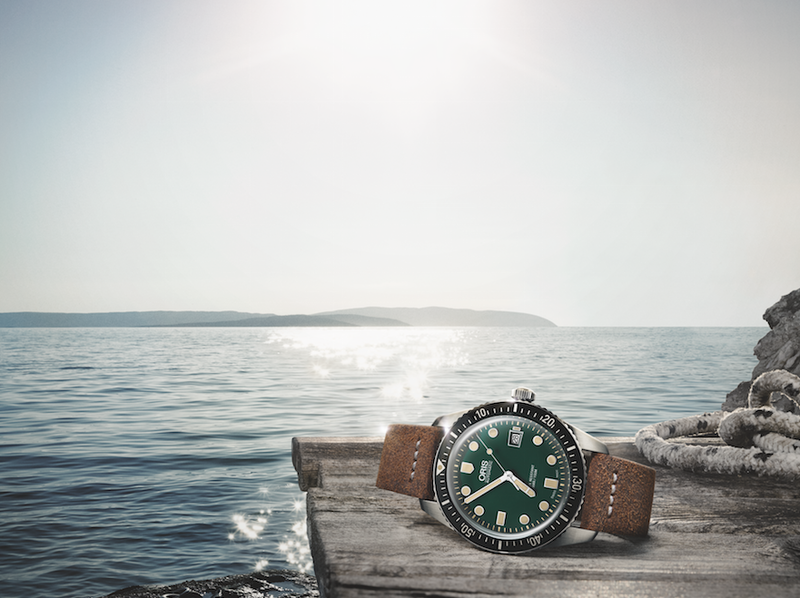 Divers have to be a certain size and with the ability to choose between 40mm and 42mm it’s a good offer for the watch enthusiast looking to buy a high-quality affordable diver. Fitted with a dark-blue dial and a slim-line case, the diver looks better than ever. The cool dudes at Oris chose a cool vintage-looking bubble-curved sapphire crystal. Adding all those cool things up creates a piece of horology that makes you want to BE a dive watch. I mean it, take a look at the pictures and you’ll understand why I’m talking strange the way I do. A cool detail of divers nowadays is the use of Super Luminova with a vintage look. This way it looks like your newly bought Oris Sixty-Five diver has been living for over 40 years and seen the titanic up close for about 10 times. Which isn’t true of course because you just got it from the jeweller and he told you it’s new. What’s also new with this 42mm model is the addition of two new kinds of straps. You have the rubbed-down leather straps on the one hand and textile NATO-straps on the other. Call me mainstream, but especially the NATO-straps have my vote. I like my diver on a NATO, yeah I know very original, but I don’t care. 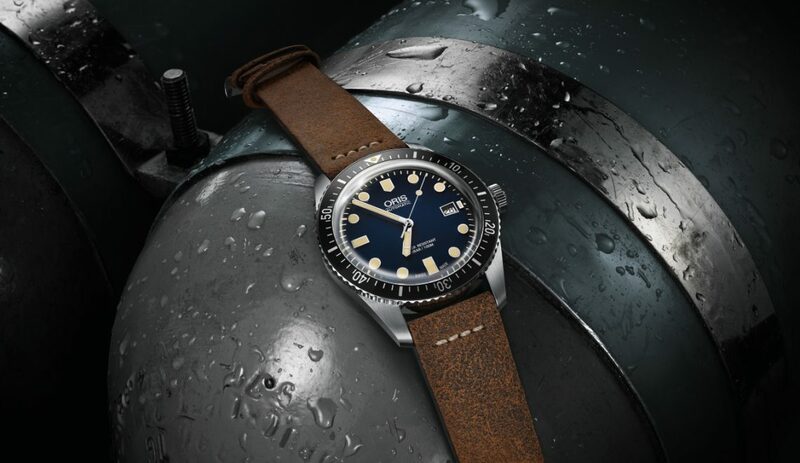 So now, you can buy an Oris diver on a stainless steel, rubber black, rubbed-down leather or NATO-strap. Decisions, decisions. 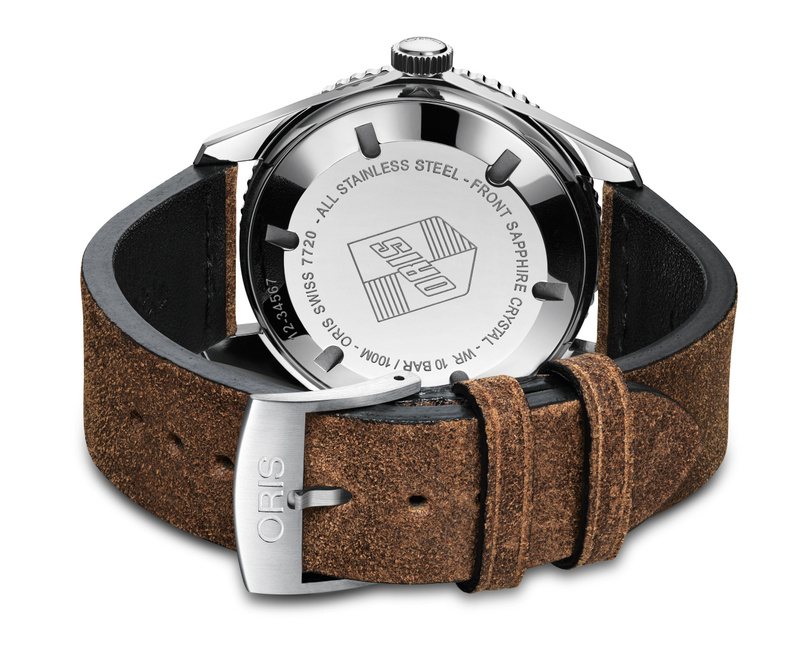 To finish off this cool timepiece, the case back is engraved with the old Oris shield as used in the 1960’s. Too much cool in this watch if you ask me. If someone from Oris reads this, I would like to see the watch up close and have a few minutes alone with it if you don’t mind. -Multi-piece stainless steel case and screw-in stainless steel crown. -Dark blue, curved dial with applied indices filled with Super-LumiNova®.